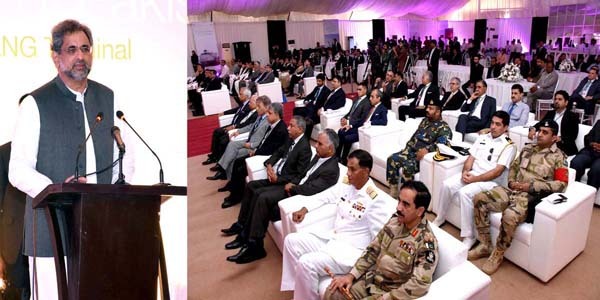 Abbasi Sunday inaugurated Pakistan’s first Liquified Natural Gas (LNG) terminal at the Port Qasim. Limited within a record time period of 330 days and a capacity to re-gasify up to 600 mmscfd. the country in record time. attempts to introduce LNG source of energy but failed. overcome its crippling energy needs. introducing the LNG based energy. the shortest time with full re-gasification facility. 100 LNG cargo ships with 6.1 million tons of LNG. energy resources like diesel or furnace oil,he added. keeping in view the largest demand and market. inaugurated in November this year. 4.5 million tons of LNG. 9 million tons of LNG for the next five year. the private sector, government and the people. would be free to opt for purchase of LNG on their own. sector failed to meet the demand, he added. appreciated government’s efforts in this regard. complete replacement of furnace based energy plants in 2019.
referred to long awaited completion of Lowari Tunnel. completion of projects despite the political upheavals. spoke for themselves, he added.